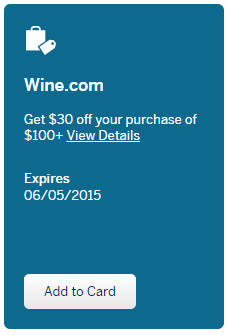 American Express is running an offer for $30 off $100+ at Wine.com with code AMEXSPRING. This appears to be very similar to an offer they ran last summer and it's a good one, but you've got to play it just right to maximize the savings. For example, with this offer you can get a bottle of 2010 Silver Oak Napa Cab for $69.99 fully loaded, delivered to your doorstep in Massachusetts (no sales tax on wine here). The best price I see for this wine nationwide is $84.95 and that doesn't include shipping costs. The offer can be used for any $100 order so I'll probably use this to restock on some daily drinkers Wine.com sells at decent prices. Refer to this post I wrote last summer for tips on how to best take advantage of this offer. First you've got to select wines that aren't heavily marked up vs. the best price you can get them otherwise. Use Wine-Searcher.com to check whether Wine.com's prices are inflated. Some wines are, others aren't. Second, you've got to minimize shipping costs. The best way to do this is sign up for a free Steward Ship trial and then cancel it before being billed. Third, make sure your order lands as close to $100 without going over too much. This way you'll maximize your percentage savings. If you want to order more than $100 worth of wine, break it up into separate orders. If you want to orders wines less than $100 add some "filler" wines (daily drinkers) to get to $100. Question of the Day: What are some of the best buys you see available now to take advantage of these deals.